Europe’s maritime capital is the ideal location for innovation in offshore wind. Maasvlakte 2 in Rotterdam offers space for offshore testing and demo facilities. But where are all these facilities and what do the various locations offer? From now on, you are able to see them in the Offshore Innovation overview. The map provides an insight into everything that Maasvlakte 2 has to offer: thanks to the conditions, the climate and the existing companies and services, Maasvlakte 2 is the ideal location for testing offshore wind facilities. There are a wide range of options on land, in the air and in/on the water. Maasvlakte 2 is exposed to a lot of wind because of its location. In addition, this part of the port of Rotterdam consists of North Sea sand and has a unique offshore borehole that is more than 25 metres deep. 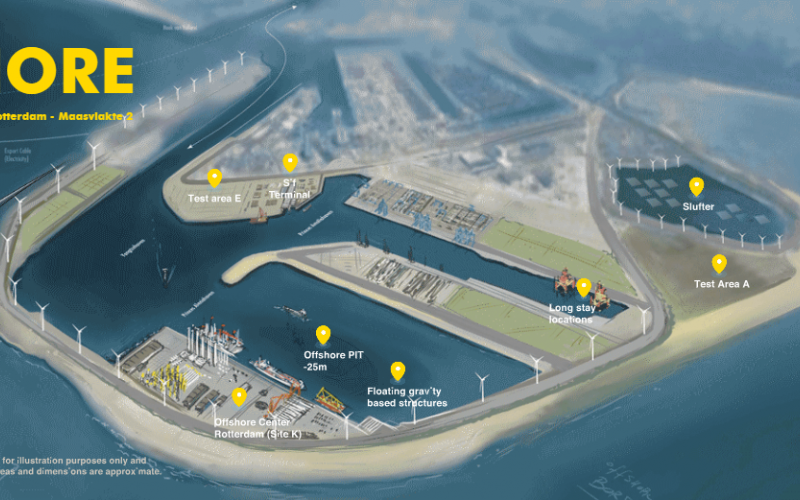 The Offshore Innovation overview is the initiative of the municipality of Rotterdam, Port of Rotterdam Authority, InnovationQuarter (link is external) and TKI Wind op Zee. Together, they are working for offshore wind in the Port of Rotterdam. Read more and apply here for a test location.